There are five lighted athletic fields for a variety of sporting events, from football, soccer, to baseball. These serve jointly as the location for 600 geothermal wells which provides the heating and cooling energy for all 75 buildings on the campus. The grandstand seats approximately 1,000 spectators; the space below doubles to house the geothermal pumping system. 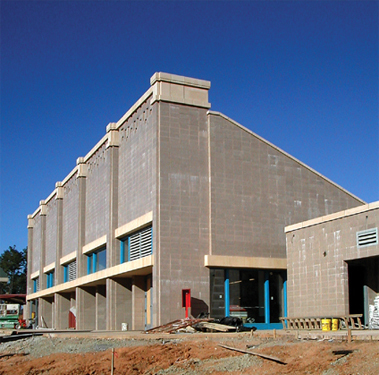 The rear elevation of this building is filled with glazing to allow viewing of the geothermal facilityan educational opportunity in itself. All equipment, including piping, is color-coded for easy reference when viewing diagrams and technical information on an ongoing PowerPoint presentation. Computers connected to the equipment also display updated technical data instantly to the observer. In effect, the facility serves as an educational center for the students, visiting engineers, and scholars who wish to gain valuable real-time information and knowledge of an extremely large geothermal system. It should be noted that the computers establish which geothermal fields are most productive at any time, then using those wells for heating the buildings while allowing the other wells to regain their energy.